NEW JERSEY -- It's a tale of international jet-setting, $1,500-a-night hotel rooms and, for good measure, allegations of affairs with models and actresses. Beyond the tabloid angles, this week's corruption trial of U.S. Sen. Bob Menendez, D-N.J., and a wealthy friend promises to put the very business of governing under a microscope - and could eventually lead to a Republican taking over his seat in the deeply divided Senate. They are charged with a conspiracy in which, prosecutors say, Menendez lobbied for Melgen's business interests in exchange for political donations and gifts that included luxury vacations, flights on Melgen's plane and stays at his private villa in an exclusive Dominican Republic resort frequented by celebrities including Beyonce and Jay-Z. The indictment also alleges Menendez pressured State Department officials to give visas to three young women described as Melgen's girlfriends. 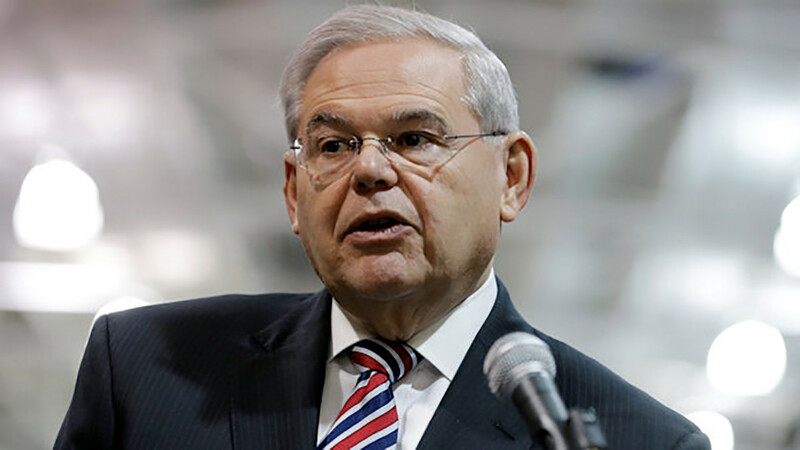 The men both pleaded not guilty, and Menendez has vehemently denied the allegations. Defense lawyers say that the trips described as bribes were examples of friends vacationing together, that most of Melgen's contributions went to committees Menendez didn't control and that he didn't control the people he lobbied on Melgen's behalf. "I'm looking forward to finally having the opportunity to seek exoneration," Menendez, who was indicted in April 2015 and has been dogged by some of the allegations since 2013, said recently. "I do believe we'll be exonerated. I did nothing wrong, and I did nothing illegal." Menendez is up for re-election next year. If he is convicted and steps down or is forced out of the Senate by a two-thirds majority vote before Gov. Chris Christie leaves office Jan. 16, the Republican governor would pick a successor. While a Democrat has a large polling and financial advantage in November's election to replace Christie, the stakes are high. A Republican-led partial repeal of the Affordable Care Act might have succeeded this summer if Menendez's seat had flipped before then. Menendez also tried to persuade Judge William Walls to halt the trial on days the Senate holds critical votes, but he rejected the request on Friday. Walls said he wouldn't change the schedule for a "cab driver" or "construction worker" and wasn't doing it for the senator. Among the gifts prosecutors say Melgen gave Menendez were flights on Melgen's private jet, vacations at Melgen's private villa in the Dominican Republic and a three-night stay at a luxury Paris hotel valued at nearly $5,000. Melgen also directed more than $750,000 in campaign contributions to entities that supported Menendez, according to the indictment, which alleges they were inducements to get Menendez to use his influence on Melgen's behalf. Prosecutors say that lobbying included a three-year effort to help Melgen avoid paying $8.9 million for overbilling Medicare, a meeting with an assistant secretary of state to help Melgen in a contract dispute over port screening equipment in the Dominican Republic, and helping one of Melgen's girlfriends and her sister get into the country after their visas were denied. Prosecutors say Menendez and staffers also lobbied for a Brazilian model and lawyer and a Ukrainian model and actress described as Melgen's girlfriends to be allowed to travel to the U.S.
Melgen's sentencing in a separate Medicare fraud case has been delayed until after his trial with Menendez. Jurors will have to wade through complex legal concepts, including whether Menendez's interactions with executive branch officials were "official acts" as defined under federal bribery statutes. That will depend on how a 2016 U.S. Supreme Court decision reversing the bribery conviction of former Virginia Gov. Bob McDonnell, a Republican, is interpreted. "This is not a black-and-white area of the law even for people who do this on a regular basis," said Mala Ahuja Harker, a former federal prosecutor in New Jersey now working in private practice. "I think people's gut sense of fairness is going to come into play: Does this offend their sense of the way politics is supposed to operate?" Marvin Overby, a professor of political science at the University of Missouri, said that whether Menendez's meetings and conversations with government officials were run-of-the-mill senatorial activities or illegal attempts to help someone who had given him gifts and campaign cash goes to the central question of what constitutes corruption for lawmakers. "The general public's sense of corruption and what is legally enforceable as corruption are often quite different," he said. The last sitting U.S. senator to go on trial was Republican Ted Stevens of Alaska, who was convicted of corruption charges in 2008. The conviction was overturned after a Justice Department investigation concluded prosecutors had committed misconduct. The son of Cuban immigrants, Menendez began his career in public service in the early 1970s in New Jersey's Hudson County, an ethnically and economically diverse Democratic stronghold directly across the Hudson River from New York City. He rose from school board member to mayor to state lawmaker to congressman before being named to replace Democrat Jon Corzine in the Senate when Corzine became governor in 2006. Christie, then New Jersey's U.S. attorney, began an investigation into Menendez's ties to a local anti-poverty group that rented office space from him at the same time he was helping it get federal funding. Christie denied the investigation was timed to influence the 2006 election, which Menendez won with about 54 percent of the vote. The case was closed in 2011 with no charges. Christie said last month that while he and Menendez have differed on many policy issues, he considered the Democrat "a very strong advocate for the state" and someone who "knows how the political system works and is a sharp-elbowed advocate for the things that he believes in." Menendez has hardly been a shrinking violet since his April 2015 indictment, and he has made a steady stream of public appearances to tout his legislative priorities and harshly criticize many of President Donald Trump's policies. After U.S. Attorney General Jeff Sessions on Tuesday announced the Trump administration will wind down a program protecting young immigrants from deportation, Menendez released a statement saying Trump has "chosen once again to cloak his presidency with a white nationalist flag instead of the diverse fabric of our multicultural American society." Menendez has also remained a leading voice against improved relations with Cuba and praised Trump's rollback of President Barack Obama's plan to re-establish diplomatic relations. The indictment also hasn't stopped Menendez from receiving financial support. He has raised more than $6 million since his indictment, between his legal defense fund and campaign, according to a review of federal filings. At a recent news conference to discuss flood insurance in a town heavily damaged by Superstorm Sandy, a middle-aged man in a T-shirt and jeans stood up and thanked Menendez for taking the time to speak directly to his constituents. Later, Menendez spoke about the people he has represented and who have supported him since the indictment. "They know who I am, and they know that I have for 43 years committed my entire adult life to public service and I've done it with honest and integrity," he said. "They know what I stand for and what I fight for."